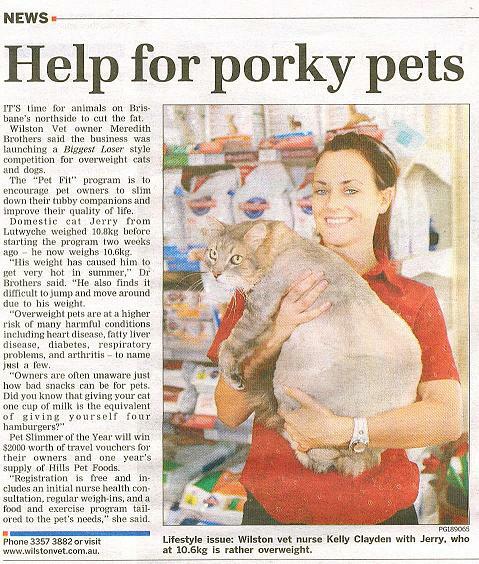 Wilston Vet has an ongoing “Pet Fit” program in conjunction with Hills Pet Foods Brisbane to encourage pet owners to slim down their tubby feline and canine companions. Each year a competition is undertaken to find the “Pet Slimmer of the Year” who will win $2000 worth of travel vouchers (for their owners) and one year’s supply of Hills Pet Food. Porky Pets just need to get their owners to register with Nurse Kelly or Nurse Melissa , who will guide them through a nutrition and exercise regime to shed their pet’s excess kilos and improve their quality of life. Registration is free and includes an initial nurse health consultation, regular weigh-ins, and a food and exercise program tailored to their individual pets needs. All you need to do is purchase the calorie controlled diet (Hills R/D) from us and follow the the weight loss plan we provide you – it’s that easy! 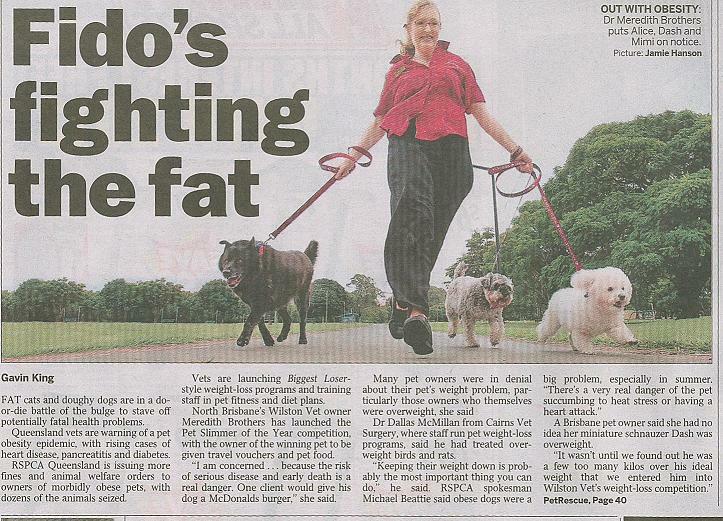 With over 40% of Australian pets considered overweight or obese, this is an opportunity to slim down your pudgy pet back to a healthy happy weight. Overweight pets are at a higher risk of many harmful conditions including heart disease, fatty liver disease, diabetes, respiratory problems, and arthritis, to name just a few. Owners are often unaware just how bad snacks can be for their pets. Did you know that giving your cat 1 cup of milk is the equivalent of giving yourself 4 hamburgers, and one 30g block of cheese is equivalent to 3 blocks of chocolate for a human! An overweight pet is at risk of a number of problems including arthritis, diabetes , heart disease, urinary disorders, reproductive disorders, cancer (mammary tumors, transitional cell carcinoma),skin disease anesthetic complications. Call Us on 3357 3882 to arrange a free weight consultation. Let us encourage and motivate you and your pet to lead a happier healthier lifestyle. Who knows…..maybe even you will loose a few kilos as well! What are the signs of an overweight cat? Is it difficult to feel your cat’s ribs or spine? Is it difficult to see your cat’s waist? Does your cat’s face look more rounded with larger cheeks? Often appear tired and lazy? Hesitate when jumping onto furniture? Have matted hair on the back or tail area? What are the signs of an overweight dog? Need help getting in the car? It is important that you have a check up with the veterinarian to rule out any medical reasons for your pet’s weight gain prior to booking in a consultation with one of the nurses. Diseases such as diabetes, hypothyroidism and Cushings all can cause your pet to put on weight. Just reducing the amount of current food you give your animal is not ideal. Although they will lose weight, they will be left hungry and may not be getting all the nutrients they need. They also may scavenge for extra food and may just put on more weight! The best way to tackle weight loss in dogs and cats is to use a diet specially formulated to be low in calories, reduced fat, and have a high fiber content to help them lose weight while keeping them full. R/D and Metabolic Diet also contains active ingredient, L-Carnitine which can help promote fat loss and lean muscle development. Exercise is important, but it can be hard if you have an older arthritic dog. However, swimming is a great alternative and there is a brilliant aquatic centre for dogs at Goodna, where you can also board your pet. Visit their site for more info – The Links Aquatic Centre. We recommend a range of Hills Science Diet and Prescription Diet Foods for Dogs and Cats as the best way to help your live a long happy and healthy life.